Purple Emu Purple Rub All Natural Pain Relief Cream O.T.C. With Emu Oil 4 oz. Jar. 100% ALL NATURAL - 30% EMU OIL. FDA approved formulation for "over the counter" topical pain relief. Purple Rub All Natural Pain Relief Cream O.T.C. is an amazing new pain relief cream excellent for sore muscles, achy joints, sprains and strains, and day-to-day discomforts from sports, chores and all activities. Purple Rub All Natural Pain Relief Cream O.T.C. has an enjoyable cooling sensation when applied to the skin with a pleasant, light scent of menthol. Purple Rub Pain Relief Cream contains no chemical ingredients. It is an all-natural formulation that also contains no polymers that can clog the skin's pores. The fact that Purple Rub Pain Relief Cream contains 30% Emu Oil gives it a high transdermal efficiency factor for carrying active ingredients deep into the third layer of the derma. Purple Rub's ability to travel deep into the skin provides you with maximum healing benefits and relief from aches and pains. Because Purple Rub Pain Relief Cream is an all-natural product it has no adverse side effects and does not cause the skin irritations sometimes associated with other rubs due to their chemical ingredients, polymers and thickeners. Most topical creams available today do contain chemical agents that block your pores inhibiting the active ingredients from performing at 100% efficiency, thus decreasing healing activity. Many topical pain relief products today contain Glucosamine and Chondroitin. Although these ingredients are excellent for joint and connective tissue health when taken orally, due to their large molecular structure they cannot be absorbed through the skin and become useless in topical applications. 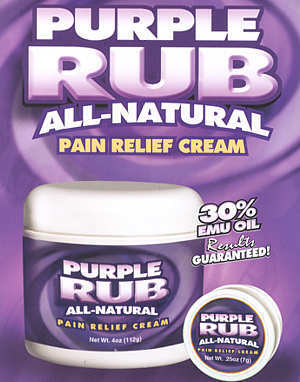 Purple Rub All Natural Pain Relief Cream O.T.C., when nothing but the best will do for your pain. Active ingredients: Menthol (7.9%) and Camphor (3%). Inactive ingredients (in alphabetical order): Aloe (barbadensis) leaf extract, blackcurrant (ribes nigrum) seed oil, borage (borago officinalis) seed oil, boswellia acid, Emu Oil (Dromaius Oil), hemp seed (cannabis sativa) oil, salicylic acid, tea tree (melaleuca alternifolia) oil, dl a tocopherol (vitamin E) and willow bark (salix alba) extract. Available in 2 sizes: .25 oz Trial Size and 4 oz.